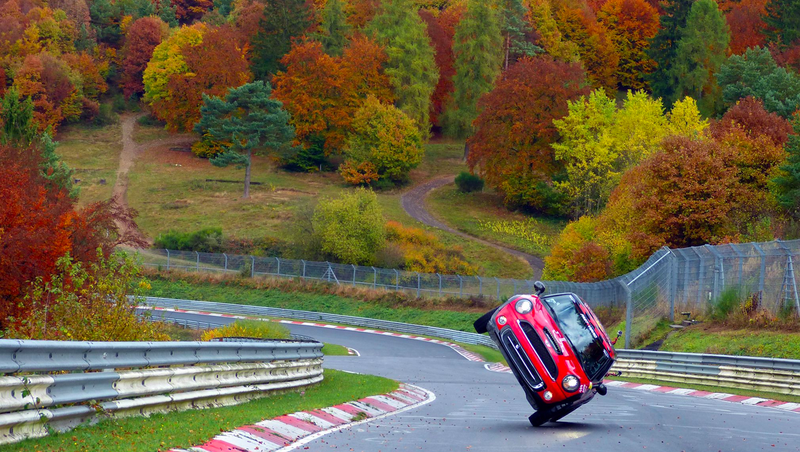 A man just drove the entire 12.9 mile lap of the Nürburgring Nordschleife with a lightly modified Mini Cooper—on two wheels. Here’s the whole thing on video. The car had been modified with a welded front diff, a solid rubber front tire, and a roll cage, and was assisted into its lean via the help of a ramp at the start of the 45 minute lap. Bridge to Gantry says Han’s average speed was about 17 MPH, but that he claims he could have gone faster had it not been for a “very strong vibration” from his back tire at speeds over about 12 MPH. And I’m sure Han would have liked to have gone faster for reasons other than simply the lap time, since the site devoted to the legendary race track says the he was “sweating and visibly in pain from the effort of balancing his car,” quoting him as saying his “shoulder was hurting by 6kms, with 15kms still to go.” Yikes. Glad he pushed through the pain for our viewing pleasure. Will Porsche&apos;s Upcoming 911 GTS Have A Six-Speed Manual?